2011 Hero Electric Optima Plus Special Ability. Picture credits - Hero Electric. Submit more pictures. The Optima Plus is a unique bike, even in its category of E-Bikes simply because it is the first e-bike aimed at the physically challenged persons. It has a number of special features like the Side Wheel shockers with independent suspension system, Special side wheel lights for safety, Side Wheel mudguard with large reflector for safety Crutch handling mechanism for easy drive. Comments: With side wheels. Range 70 km. 6-8 hours charging time. Sold in India. Ask questions Join the 11 Hero Electric Optima Plus Special Ability discussion group or the general Hero Electric discussion group. Get a list of related motorbikes before you buy this Hero Electric. Inspect technical data. Look at photos. Read the riders' comments at the bike's discussion group. And check out the moped's reliability, repair costs, etc. 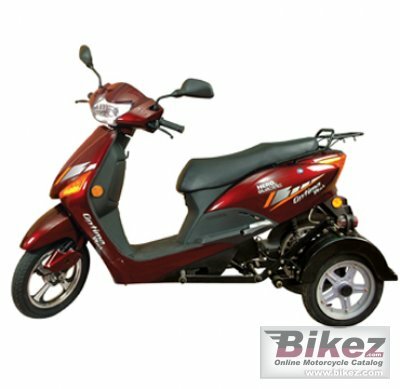 Show any 2011 Hero Electric Optima Plus Special Ability for sale on our Bikez.biz Motorcycle Classifieds. You can also sign up for e-mail notification when such mopeds are advertised in the future. And advertise your old MC for sale. Our efficient ads are free. You are also welcome to read and submit motorcycle reviews.